It was a century ago this evening that an epic tragedy, the sinking of the Titanic, began. Among the first-class passengers aboard that famous ship was Lady Duff Gordon, also known as Lucile, a British couturier. She survived the disaster, but not without scandal. 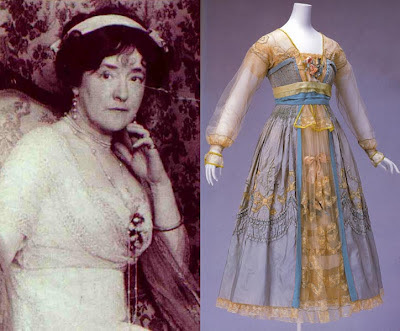 Lady Duff Gordon photographed about the same time as the 1912 tragedy; at right, a 1917 robe du soir in her signature style. Another Titanic passenger was Edith Russell, an American fashion reporter who recounted her experience for the BBC in 1970. Ms. Russell remembers that at the moment the iceberg struck, she was entering her state room. At that moment she heard only a series of bumps, and called a friend nearby to go on deck and investigate. At first, her companions were amused by the iceberg's presence and made snowballs from the iceberg's shavings. At the time, she was wearing a white satin evening gown as the guests had just enjoyed an evening gala. After the impromptu snowball gaiety, Ms. Russell soon re-entered her state room and went to bed. In the middle of the night, she was awakened by a man and was told to arise and leave the ship. Ms. Russell had only one dress suitable to be worn at the moment - it was a woolen sheath dress with a hobble skirt, "only half a yard" width at the hem and very difficult to walk in. She also wore a wool cap, a thin broadtail coat and two fox furs, with silk stockings and velvet slippers with diamond buckles. An example of a hobble skirt from a 1913 fashion illustration. The severely narrow width was considered a status symbol of well-kept women at the time. Before leaving her state room, she took time to lock all the trunks and windows and then waited rather grumpily in a chair on deck, believing the precautions to be unwarranted. In those locked trunks were a large number of French couture fashions bound for American clients. In contrast to that safety measure, Ms. Russell chose to leave all her jewelry and money in the ship's safe, believing she would return in the morning to the ship. This assumption caused her to continue afterward in three years of "acute starvation" upon arriving in America, as she'd lost a large sum of money due to the hasty decision. Before leaving the Titanic on that fearful night, Ms. Russell in her hobble skirt felt assured that this unsinkable ship was nothing to abandon. Upon hearing that she urgently must board a lifeboat, she relayed to a sailor that there was simply no way she'd be able to step into one with such a narrow skirt - "Not me, I'm not an acrobat" she said unsteadily. The sailor and another gentleman proceeded to literally throw her "head foremost" into the lifeboat, where she was the next-to-last passenger accepted on the very last lifeboat. Despite her fashionably narrow skirt and its (literally) hobbling effect, she survived the ordeal and arrived nearly empty-handed in New York, sans money, jewelry or her clients' couture designs. Such a massive disaster makes the loss of sundry clothes seem so very trivial, which it is. These luxurious trappings are, however, part of what makes the Titanic tragedy so riveting for so many, as extant jewelry and similar remnants line the halls of many a Titanic museum exhibit. And for those experiencing the event in pre-World War I society, the heartbreakingly somber stories and the dramatic losses, both human and material, seemed to mark the end of the Gilded Age. 1917 Lucile dress - Fashion: the Kyoto Costume Institute : from the 18th to the 20th century, Taschen.